A small island located at the north tip Malaysia. It’s hot and not too much populated. If Indonesia has Lombok Island, then Malaysia has this island, Langkawi. 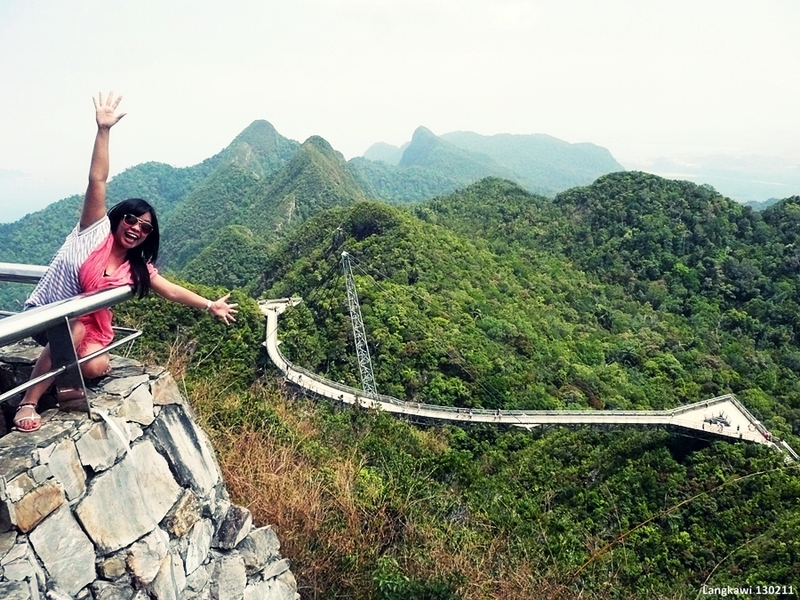 It is located 705 metres (2,300 ft) above sea level at the peak of Gunung Mat Chinchang on Pulau Langkawi. 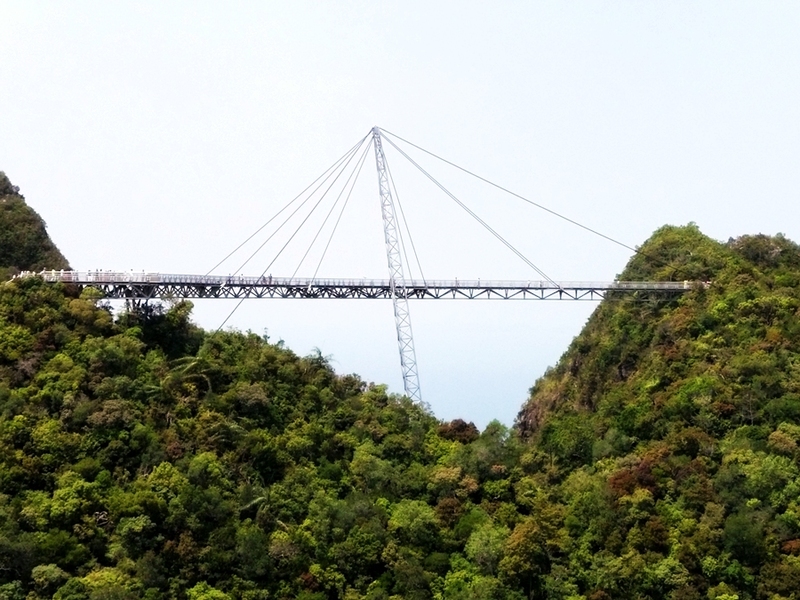 Langkawi Sky Bridge is a – 125 metres (410 ft) curved pedestrian cable-stayed bridge. 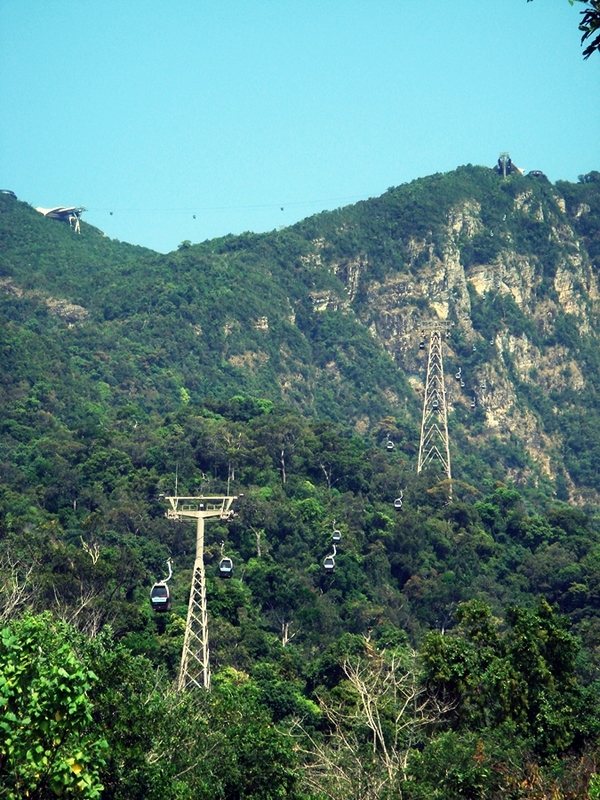 It’s accessible by the Langkawi Cable Car. Nice view from up there! Want to see yachts? Or you want to rent it? 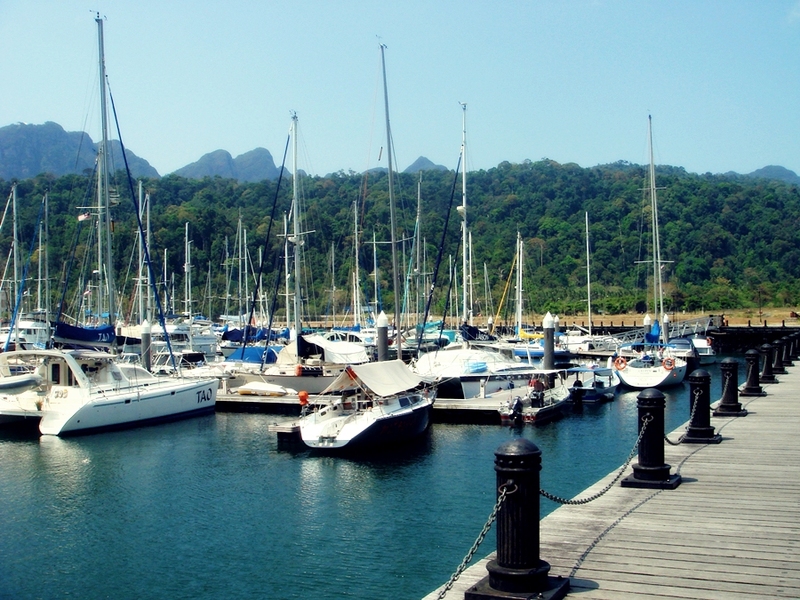 It’s located on Pantai Kok, in the northwest of Langkawi. It takes 45 minutes from Kuah town by car. 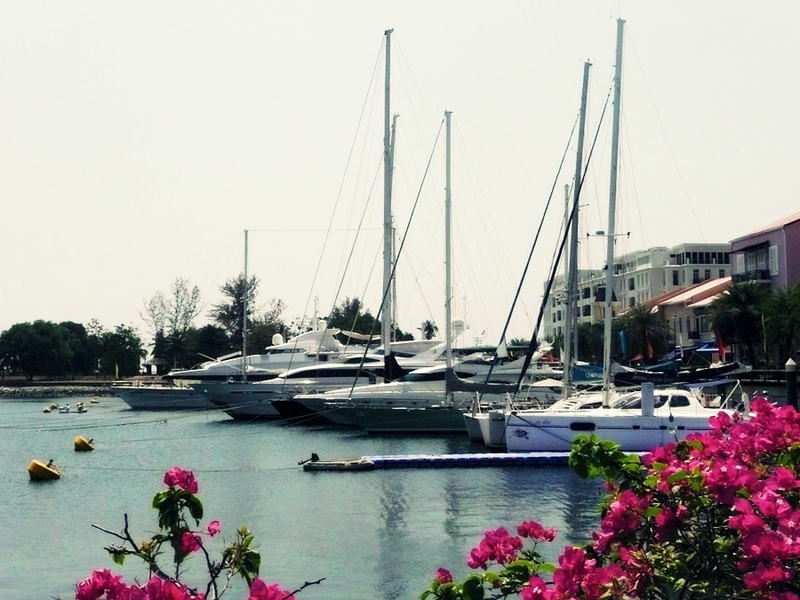 This harbour is a scenic spot to take some photos and enjoying the marina’s view. Eagle square is a giant sculpture of a reddish brown eagle, facing toward the sea. 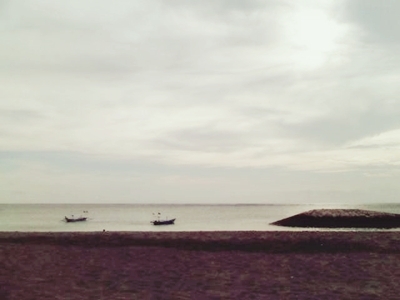 It’s situated near the Kuah Jetty. 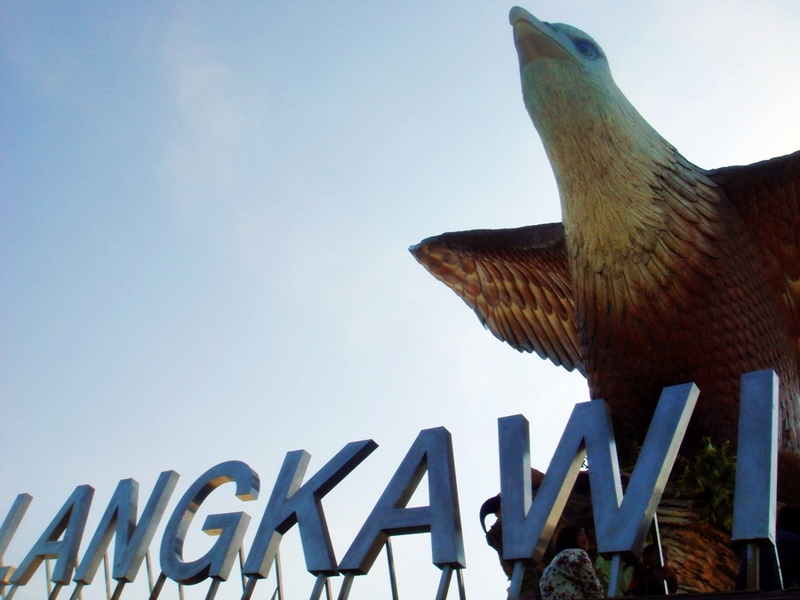 This is the most famous landmark of Langkawi. The road links various areas around the island, were built in very good condition by the government. Wide and smooth, seemed empty enough with small number of vehicles that cross it. You can’t find any public transportation, except taxi. But there are many car rentals that you can choose from the airport. Remember to bargain, yet they aren’t too expensive actually. Look like that this island has been designed as a tourist destination. Many tourism spots are quite attractive on the map. In fact, the natural beauty of Indonesia remains undefeated! You can find almost all of them in Indonesia, but I have to admit, they are successful in creating stories that attract tourists to come. Those stories were created to increase the selling value of the nature itself. That’s not bad, and we can learn from that. It’s about creating the story! You don’t need too many days to spend here, 2-3 days is enough. For hotel, quite much type of hotel that can choose to stay. One of recommended 2 stars hotel is Azio Hotel in Kuah town. It’s new, cheap, comfortable bed, hot water, shower, and the most important is clean! You can go online to book the reservation. Don’t worry if you’re hungry, you just need 1-2 minutes in distance walking to the Water Garden Hawker Center (in the morning) and it changes to Rootian Seafood Restaurant at night. Yummy taste and cheap!! 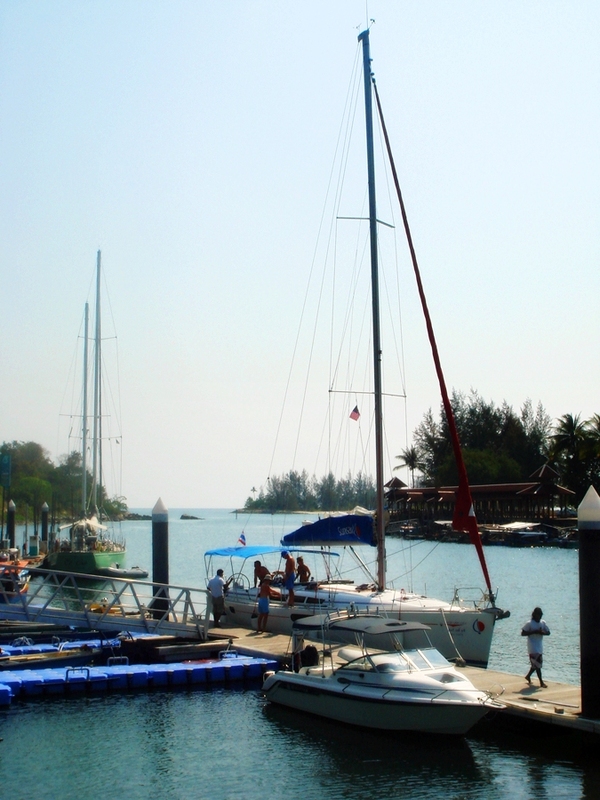 Touring in Langkawi, you just need to rent a car, bring the map, and driving around the island. There’re many duty free stores around the Kuah town. So, if you like chocolates, I’m telling you, it’s cheaper here! Not only chocolate but also perfume, wine, cigar, and so on. Are you ready to go? Bring your sun block lotion with you always! To see more photos of Langkawi just click this link. Hong Kong has so many interesting places to be visited. Besides the shopping destination, if you like to find a local, different, natural, and yet full with Hong Kong culture and daily life, this place could be another suggestion for you. 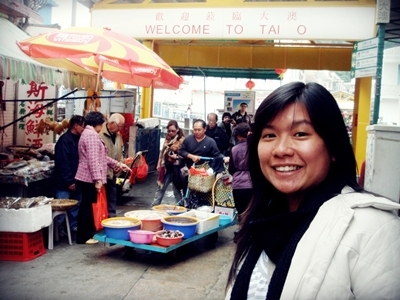 Please welcome, Tai O! 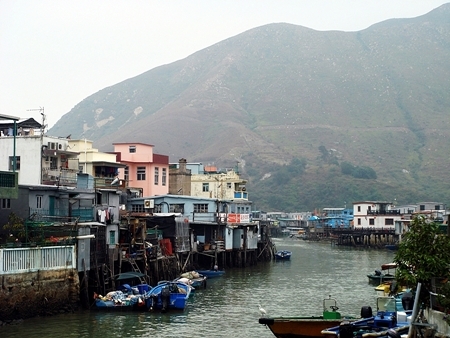 Tai O is a local fishing village, which is located in the western side of Lantau Island, Hong Kong. 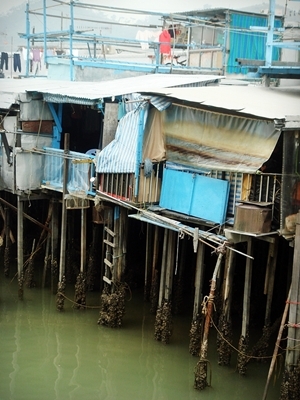 It is known for the pang uks, sort of stilt houses built right over the waterway. The bottoms of the 3-4 meters wooden stilt already become the habitat for small oysters. So unique scenery! You can’t find cars or motorbikes in front of the stilt houses but small ships or boats. Although those are stilt houses, some also have air conditioning, big screen television, nice kitchen and restroom inside, small “garden” and more of it, balcony! You can do your own tour on foot, going around the village. There are some pedestrian bridges which are good enough for photo shoots. 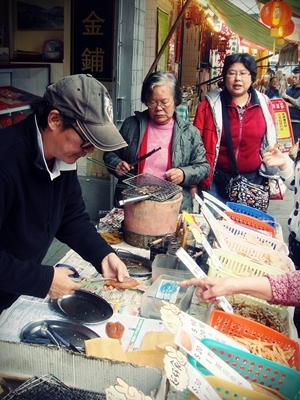 If you love seafood, no worries you’ll love Tai O. Although, currently the fishing lifestyle is dying out, many residents still continue to fish. 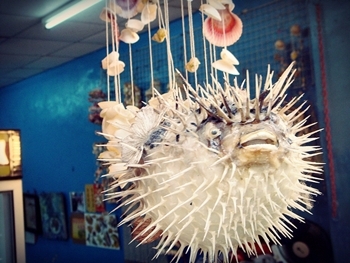 They sell fresh seafood, dried or salted seafood, and many type of delicious local snacks! 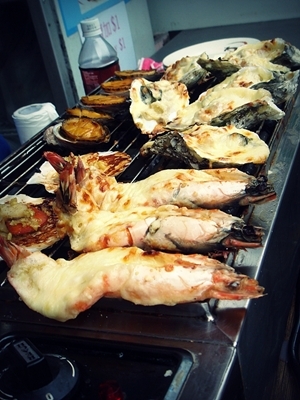 Try their smoked salted fish-egg and shrimp, without any spice it’s just smoked over charcoal, but oh.. it smells so good! Keep walking and you’ll find baked oysters, prawn, and scallop, with melted cheese on top. Don’t miss to drink the sweet sour red tea. The village is placed mostly on the bank of the river but you can see the rocky mountains standing at the back of the village. You can join the resident’s boat by paying the fee, just sit and prepare your camera; they will take you down along the river. Or ask them to drive you to the sea where you can see Chinese white dolphins, if you’re lucky. I was going there by bus (11) from Tung Chung terminal and it took around 45 minutes. Try not to fall asleep or you’ll missing interesting spots to see along the trip. 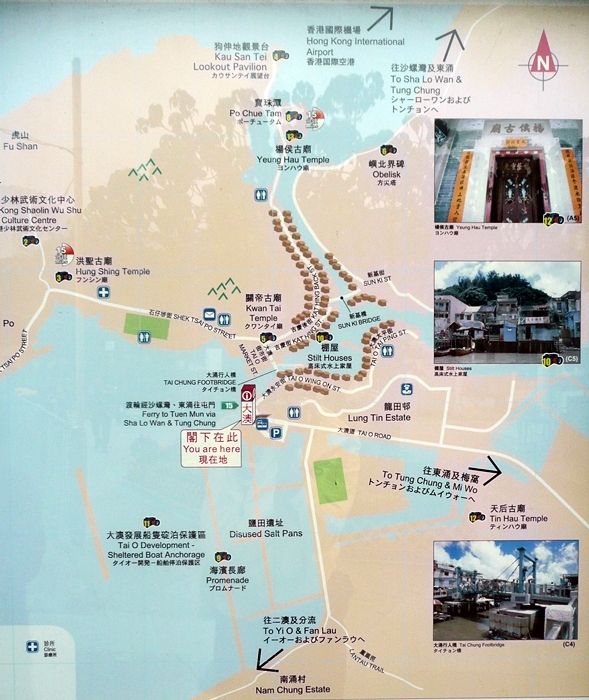 You may reach Tai O by bus from other locations, like Mui Wo (1) and Ngong Ping (21). But if you want to take ferry, just try to depart from Tuen Mun, Tung Ching, and Sha Lo Wan ferry piers. Enjoy experiencing a different side of Hong Kong! 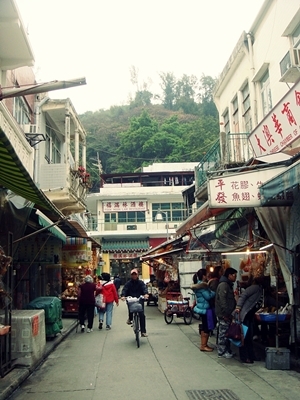 Feel free to check another photos of Tai O. “Here it comes again and it should be my turn to go!”, a voice whispering in my heart. Sunday afternoon in the middle of service, there’s an announcement about Merapi Mission Trip. ICA open 20 seats for those who want to go to Jogja, bring the 1000 packages, and distribute each of them directly to the Merapi Mountain eruption victims. The team will leave from Surabaya on the next day, Monday, at 5 AM. And will depart from Jogja a day after, Tuesday, at 5 PM. So, they will be back here at Wednesday dawn. Wow! The trip is quite short and must be tight. Something’s telling me to go this time. I admit that I kept myself updated about Merapi eruption since its first eruption, long before this mission trip announced. 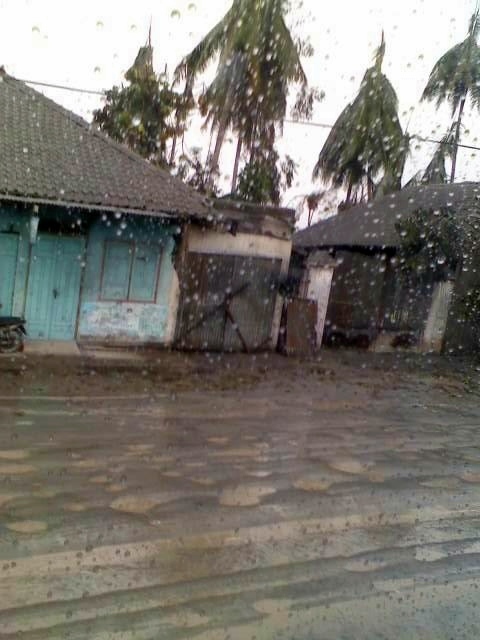 Few years ago, I ever went to Jogja, stayed in Kaliurang and have a good memory with it. My uncle took my family to the nearest Merapi monitoring post in Magelang. On that cold night, without any telescope, I still could saw the lava run out from the top of mountain. Yeah, Merapi is never sleep. Maybe because of that proximity, I do want to go. My brother was here, he came from Jakarta and we went to church together. I’m joking, “if you pay the 750 thousand, then I’ll go!”. He replied, “Ok, just if mom and dad allow you.”. Well, my mom and dad always hold back if their daughter wants to go to a mission trip. Sidikalang and Nias mission trip: I didn’t get the permission to join. I texted mom, it’s around 2 PM, and she said no, you don’t have to go there. Ok then, I am not going. But, suddenly 30 minutes later, Mom text me again and said I could go if I really want to. “You’ll never get there without being in a mission team”, mom said. I could go if my office let me go, since I still don’t get any leave periode during this contract. There were only 5 seats left. Struggling to get the permit and finally at 5 PM, I say yes to join the team! It’s hard to get the permission but I want to go, so lets try to make it happen! I don’t even know the transportation or accommodation, or is there anyone in the team that I knew, and what to bring. All I know, I’ll be with ICA mission team who’s really reliable for mission trip. Actually, my heart and mind was indecisive beacuse of a problem. So this could be my short sanctuary to think and more of it, I could help the others. So, I only have less than 12 hours to get ready. I come at church around 5 AM in Nov 8, 2010. Only some faces that I knew before. I am the one and only ICA East member on that trip! The rest is from ICA West member. For many of them, the Merapi Mission Trip is the 5th or more mission trip they ever joined. So, I’m a freshly newbie. A little bit frightened mixed with excitement. Afraid because I don’t know what to do. I just try to say YES for the opportunity that comes to me. If you asked me, don’t you afraid? You’re going to an area when the disaster is stil happening. Hmm.. No! Really, I’m afraid more about what I have to do there rather than the possibility of the eruption itself. God knows my heart, my motivation, I just want to share God’s love to the victims. So, God will take care of me, He won’t let any bad things happen to me and the team. But it doesn’t mean being silly! 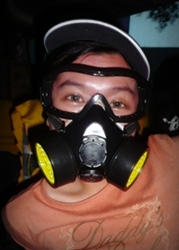 ICA requires each of us to fully covered with special mask, special goggles, long sleeves, trousers, shoes, cap, raincoat, and another safety tools. Our team visited 6 refugee camps in suburb of Jogja, those are around Prambanan, Sleman, and Muntilan. We droped and distributed the packages. In some refugees camp we also do the medical service, complete with doctor and free medicine. I tried to communicate with the local residents and Merapi victims who’s lost their properties. For the mission trip itself, I’ll write the details report on the next post. I’m glad that God gave me opportunity to listen to their stories. Stories which I won’t get it from the media. And the most important, I hold their hand, saw their faces, and prayed for them. Isn’t it beautiful? I felt different about this disaster while I’m in Jogja by myself; and with what I knew from the media. Not saying that media was lying and over published, but it’s just different. A feeling that I can’t deny. Moreover, what I saw along the way to Muntilan refugee camps makes me felt “it”. Something that I can’t explain but I can feel it. Houses left by the owner, desolated city, roof collapsed, road covered with volcano ash and perforated because of it, rain made you see the milky water, sulfur odor filled the air, trees knocked down by the ashes and water. Terrible.. The refugee needs our support, pure smiles that strengthen them, help, and pray from us. I realize now, why I don’t even worry about the accommodation and so on? Because all I knew just following my heart that told me to go. I won’t never be ready to go, until I take the chance to go and make myself ready! Maybe what the team and I did, doesn’t mean anything for you here, but I already took and let my heart visited the refugees due to this Merapi eruption. How beautiful the chance that I’ve got: I could give a heart for Merapi..
Terlalu manis untuk tak kulukiskan dalam kata dan kuwarnai kalimat yang sanggup gambarkan semua ini..
Aku, seorang diri, sedang berbaring di kursi panjang tempat turis menikmati teriknya mentari membakar kulit kaukasia mereka. Sore ini jam menunjukkan pukul 4PM waktu Indonesia bagian tengah. Awan biru berbaris menaungi mentari hingga sengatnya terasa bersahabat. Aku berpakaian kuning tanpa lengan berpadu dengan celana hitam pendek. Dinaungi tenda dan berbaring malas menghadap pantai. Pantai yang dicintai seluruh manusia di dunia, Pantai Kuta. Kali ini Kuta sangat ramah, karena pantai ini ada di area hotel berbintang lima yang dipenuhi turis asing. Terasa begitu privat sebab tak berbagi dengan ribuan kepala seperti biasanya. Angin pantai berhembus dengan nyaman, membelai kulitku yang terbakar mentari Bali siang tadi, menerbangkan helai rambutku sesuka hatinya. Terkadang keras terkadang lembut. Seimbang, porsi yang pas. Aku menatap lekat panorama yang tak mudah ketemui. Pasir pantai yang halus terhampar luas dan jauh landai di hadapanku. Bercumbu dengan air laut yang membasahinya. Ombak bergulung di kejauhan dari ujung horison nun jauh di sana. Tumpukan karang pemecah ombak tersusun rapi di sudut kanan mataku. Beberapa buah perahu beracak di sudut lain mataku. Berwarna warni menghiasi biru keabuan laut. Burung-burung perkutut terbang rendah lalu mendarat di pasir seperti merasakan damainya semua ini. Alunan nada dari Sandhy Sondoro, suara khas Michael Buble, It Might Be You versi Dave Koz, dan petikan gitar Depapepe berdansa dengan irama angin yang semilir menari-nari di telingaku. Nun jauh di sana, sayup-sayup deru burung besi yang mendarat dan tinggal landas di Ngurah Rai masih terdengar. Seorang diri melupakan kegelisahan hati, membebaskan diri dari tekanan pikiran dan masalah. Seraya merayu hati tuk memberanikan diri mencari jalan keluar atas semua itu. Segera setelah surga kecil ini berlalu. Tak terbeli dengan uang kenikmatan dan ketenangan yang kurasakan saat ini. Tak mudah tuk kualami lagi. Sebab itu, kukecap dan resapi setiap detik yang kulalui di titik ini. Layaknya hadiah kecil tapi istimewa untuk hari jadiku ke-23. Kesendirian ini, dengan pemandangan ini, angin ini, lagu ini, dan rasa ini. Satu jam sudah berlalu, saatku harus pergi meninggalkan surga kecil ini.